Current advances in lidar technology provide opportunities to take a fresh look at wind turbine control. The wind is not only the main energy source but also the major disturbance to the control system. Thus, knowledge of the incoming wind is valuable information for optimizing energy production and reducing structural loads. Due to the measurement principles and the complexity of the wind, the disturbance cannot be measured perfectly. This forms a challenging task for estimation and control. Within this thesis project, research has been carried out in the field of predictive control for onshore wind turbines. 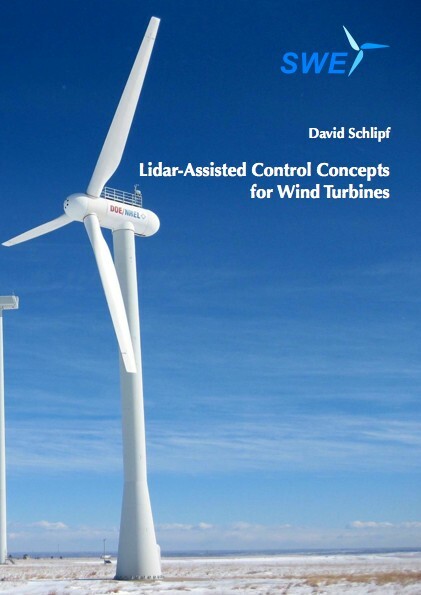 The thesis presents concepts of lidar-assisted control to reduce the structural loads and also to increase the energy yield of wind turbines, both of which make wind energy more competitive. The key challenges have not only been to develop appropriate feedforward control methods applicable to an industrial feedback controller, but also to investigate turbulence characteristics and to derive lidar measurements techniques to provide a usable preview signal. The combination of these findings made a proof-of-concept possible on two research wind turbines using a commercial and an adapted lidar system.